This site is owned and operated by The Settle-Carlisle Railway Development Company Limited of Town Hall, Market Place, Settle, North Yorkshire, BD24 9EJ. If you have any queries about these terms and conditions or if you have any comments or complaints on or about our website, you can contact us at this address, by email at admin@settle-carlisle.co.uk or by telephone on 017683 53200. All rights, including copyright, in this website are owned by or licensed to Settle Carlisle Railway Development Company Ltd. Any use of this website or its contents, including copying or storing it or them in whole or part, other than for your own personal, non-commercial use, is prohibited without our permission. You may not modify, distribute or repost anything on this website for any purpose. Vouchers cannot be redeemed for cash in part of whole. 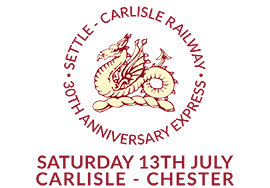 They can only be used for the purchase of items specified on this site and cannot be used for purchases from the Settle Carlisle Railway trolley service. Members of the Friends of the Settle-Carlisle Line who live outside the eligible postcode area can purchase a Friends’ Dales Railcard, which provides the same benefits. Information about the Friends and their Dales Railcard scheme is available at foscl.org.uk. The Dales Railcard can be used for journeys from stations between Leeds (and Bradford Forster Square) to Carlisle and/or Morecambe, plus Brampton and Wetheral on the Hadrian’s Wall line. It can also be used from Clitheroe/Whalley to Hellifield on Sundays only. It cannot be used exclusively within the Leeds/Bradford/Skipton area or exclusively between Carnforth, Lancaster, Bare Lane and Morecambe. Dales Railcards are valid for 12 months from the date of issue or commencement date. The cost of the Dales Railcard is set by the train operating company and is subject to change. Where orders are received and the current price has not been paid, the order will not be processed and the buyer contacted accordingly. It is not transferable and can only be used by the person named on the railcard. No replacements or refunds will be issued for unused, lost or stolen railcards. No refunds are given on unused or lost tickets. The Dales Railcard gives the holder a discount of one third of the cost of Single, Day Return and Standard Open Return tickets between valid stations. Up to four children (ages 5 to 15 inclusive) can travel with a railcard holder. The child fare is based on a 81% discount on the adult fare. There is a minimum child fare of £1. Dales Railcard holders can take advantage of the annual winter offer of a special reduced fare. Occasionally other special offers are made available to Dales Railcard holders. Every effort is made to advise Dales Railcard holders of any special offers by post or email. Alternatively, details of any special offers can be found at settle-carlisle.co.uk. Applications can be made online at settle-carlisle.co.uk. Allow seven days for processing and delivery. Applications to renew the railcard can be made up to one month in advance. Any breach of the terms and conditions of the Dales Railcard will result in immediate confiscation of the card and offenders may be prosecuted. This also applies to purchasers who are found to have provided false address details in order to obtain their card. No refund will be given in these circumstances. Some products in the online shop are produced, held in stock and sold by our carefully selected and approved partners. If you purchase any of these items, additional specific terms and conditions of sale may also apply. These additional terms and conditions will be clearly displayed in the item’s description in the online shop. Postage and packing charges for items supplied by our partners may vary from the Settle-Carlisle Railway Development Company’s standard charge and this will be clearly indicated to you. Our partners will be entirely responsible for fulfilment of their orders and when purchasing goods from these partners, your contract will be between you and the individual supplier. You are able to correct errors on your order up to the point on which you click on “Submit” during the ordering process. We reserve the right to charge an administrative fee where an invalid order has been submitted (eg Where the applicant does not reside in an eligible postcode). The prices payable for goods that you order are as set out in our website. All prices are inclusive of VAT at the current rates (where applicable) and are correct at the time of entering information. The delivery charge is dependent on the weight and size (prices include VAT) and includes costs of administration, postage and packaging. Goods will be despatched by the cheapest method. Orders for Dales Railcards or Music & Ale Train tickets only are subject to a charge of £1.30 (including VAT) for administration, postage and packaging. Railcards and tickets are despatched by Royal Mail First Class. The delivery charge applies to addresses within the UK only (excluding the Channel Islands). We do not deliver to addresses outside this region. Goods will be posted to the address you specify in your order. It is important that this address is accurate. We cannot be held responsible for delayed or lost post. Goods will be delivered within 30 days of receipt of your order. Under the Consumer Contracts Regulations 2013 you have the legal right to cancel your order within 14 days of receipt of your goods (with the exception of any made to order items). You do not need to give us any reason for cancelling your contract nor will you have to pay any penalty. However, you will need to notify us in writing or by email if you wish to cancel your contract. Goods must be returned within 14 days of cancelling the contract. You cannot cancel your contract if the goods you have ordered are newspapers or magazines or if you have taken any DVDs, audio or video recordings or computer software out of the sealed package in which it was delivered to you. If you have received the goods before you cancel your contract, you must send the goods back to our contact address at your own cost and risk. If you cancel your contract but we have already processed the goods for delivery you must not unpack the goods when they are received by you and you must send the goods back to us at our contact address at your own cost and risk as soon as possible. Once you have notified us that you are cancelling your contract, any sum debited to us from your credit/debit card will be re-credited to your account as soon as possible and in any event within 14 days of your order PROVIDED THAT the goods in question are returned by you and received by us in the condition they were in when delivered to you. If you do not return the goods delivered to you or do not pay the costs of delivery, we will be entitled to deduct the direct costs of recovering the goods from the amount to be re-credited to you. Any refunds made will INCLUDE the original post and packaging charges. For your convenience, a cancellation form can be downloaded here. We take any complaints very seriously and we aim to respond to complaints as soon as we possibly can. If you are not happy with your order for any reason, then please contact us direct. We aim to resolve any issues as swiftly and amicably as possible. Unless otherwise expressly stated in these terms and conditions, all notices from you to us must be in writing and sent to our contact address at SCRDC, Railway Station, Clifford Street, Appleby in Westmorland, CA16 6TT and all notices from us to you will be displayed on our website from to time.